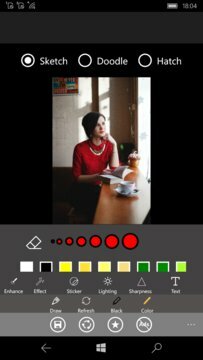 Free app to make pencil sketch of your photos. You can pick a picture from your gallery or capture one from your camera to generate the sketch. Artistic sketch results can be easily created by JUST one button tap. There are two controls to adjust your sketch: one is for brightness, the second is for sketch abstraction (from soft sketch up to hard unreal pencil drawing!). Saving images can be done quickly by a single touch of a button. Sharing pics are also supported. Photos can be shared via Facebook, Twitter, E-mail, Message, etc. Created pencil textures are very realistic and customizable. Textures can be gray, sepia, pen color or pale green. - Import your photos from Gallery or Camera! - Apply pencil effect to whole image! - Add pencil texture to image! - Apply sketch effects of different colors: pencil, pen, sepia, etc.! - Customize pencil sketch - you can adjust the pencil intensity and you can create color sketch! - Configure brush size and hardness! - Share your masterpiece via Facebook, Twitter, Instagram, E-Mail, MMS and other applications! The structure of the app is very simple and clear: even a child can use it! However, despite its simplicity, it provides a decent quality for your images. 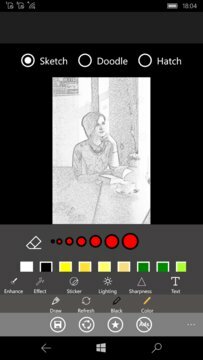 You can give a sketchy effect to your photos instantly without pencil and paper. You can also adjust the levels as per your choice. So download it and feel like an artist creating masterpieces from photos!